Jacob, who is 17 years old, and Shankar, who is 19, were discharged from the hospital at Pondichery (PIMS) on Wednesday 4th October. Jacob underwent surgery in order to remove his gallbladder and had to stay in hospital for 12 days. Everything went well and he made a quick recovery. He was back in class on Wednesday 11th October! 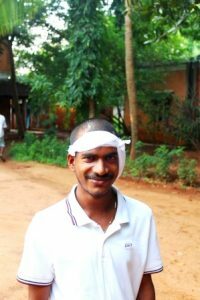 Shankar also underwent surgery on Thuesday 3rd October to try and rectify problems he has been having with his ears. We are pleased with his recovery and he shall return to work this Monday 16th October, following a few days of rest and recuperation at Shanthi Bhavan alongside the adults! During their time in hospital, Jacob and Shankar were accompanied by Thiru, a patient at Shanthi Bhavan.The youngsters at Nava Jeevan also took it in turns to keep them company! The total bill for both stays at hospital came to 21 261 roupies. Jacob’s hospitalisation cost 11 261 roupies and Shankar’s 10 000 roupies. This is equivalent to a total cost of 278 €.The costs include hospital care, surgery and medication.